Lots of customers ask us how long paper gym floor tape will last when applied to a hardwood floor. Factors like the amount of play, cleanliness of shoes, temperature and humidity all impact tape life. One thing that lots of users overlook is proper preparation of your floor before tape is applied. The cleaner and drier your floor, the better the tape will adhere and the longer it will last. Simiple mopping and sweeping is not enough. 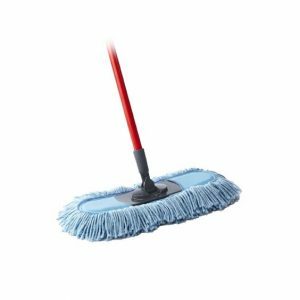 Your final step before taping should be to mop your floor with a microfiber dust mop. Microfibers are designed to trap and hold dust and other small particles that can get trapped under tape. The more microparticles, the less adhesion the tape will have.